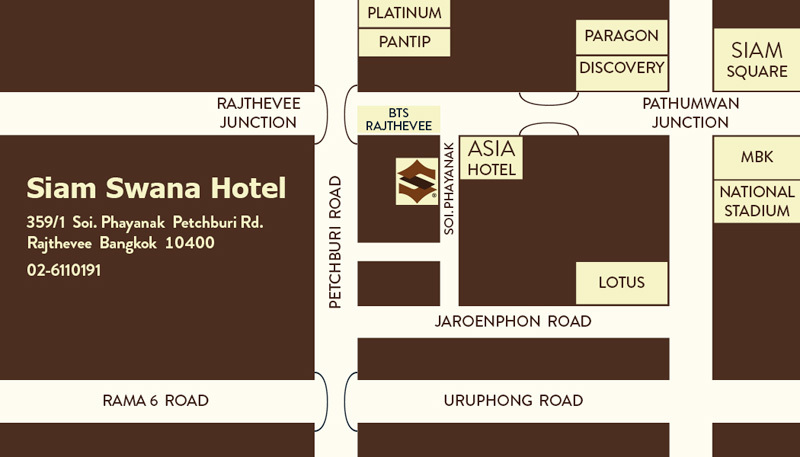 Located within 5 mins walk from Ratchathewi BTS, this hotel enjoys a good location and has a Japanese restaurant, 7-Eleven, Thai restaurants, coffee shops, massage parlours and some food carts in the immediate vicinity. The hotel offers affordably priced AC rooms with bathrooms that are spotlessly clean and there is a beautiful pool for a refreshing dip. The staff is kind and very friendly assuring a comfortable stay. Siam Swana Hotel Bangkok is a 3-star property in Bangkok that never fails to charm its guests. Situated in the best-rated area in Bangkok, the hotel offers a comfortable shelter for couples/honeymooners looking for a perfect holiday. Siam Swana Hotel Bangkok features an outdoor pool and spa and wellness centre for its guests to calm their senses and enjoy their vacation perfectly. The hotel also features contemporary amenities along with a welcoming & friendly staff. 24-hour front desk is available for all the guests. The hotel also provides taxi service for the convenience of its guests. Its proximity to the nearby tourist attractions like MBK Shopping Centre, Siam Paragon, Platinum Mall, Central World, and Pratunam Market and public transport terminal like Ratchathewi BTS Skytrain Station adds to its popularity among tourists in the area. The property is 20 Km from Don Mueang International Airport and 25 Km from Suvarnabhumi International Airport. Siam Swana Hotel Bangkok with friendly staff has a wide range of elegant and carefully adorned rooms. Some of the rooms have DVD players and lounge areas. It offers rooms under three categories, including superior double or twin room, two-bedroom suite, and one-bedroom suite. One can choose any room to enjoy the beautiful city views. Guests can go for the iconic Two-Bedroom Suite that makes an ideal pick for those who visit the hotel in a large group. Moreover, suites at the hotel feature modern Thai decor. All the rooms are equipped with flat-screen TVs, free movie channels and free bottled water, private bathrooms with relaxing hot-water showers, as well as free Wi-Fi. Siam Swana Hotel Bangkok proudly boasts of pool, spa and wellness centre. It also features restaurants and bars with in the hotel premises to provide the guests sheet comfort. Besides, the hotel features a parking area, along with complimentary Wi-Fi. Some of the hotel rooms have DVD players and lounge areas. It also offers massage, luggage storage, room service, and Internet connectivity. Further, guests can avail massage and spa treatments and other wellness services. The hotel provides a child friendly ambience as well. Siam Swana Hotel Bangkok maintains two restaurants namely Sushi Masa and Pool Bar Cafe. The Sushi Masa offers a range of authentic Japanese dishes. The wide range of delectable cuisines is prepared by well trained chefs. The pool Bar Cafe allows its guests to enjoy Thai and international dishes beside the pool. Further, one can gorge on appetizing food at the separate Sushi Bar in Sushi Masa. Moreover, it serves an array of cocktails. Guests who wants to enjoy meals pivately in their rooms cal also avail room service. Onc can let go all the stress and anxieties while indulging in a range of well-being activities arranged by Siam Swana Hotel Bangkok. Dream Spa provides rejuvenating body and Thai massage that gives one total relaxation. Being one of the best hotels in Bangkok, it makes sure that a certain standard is maintained which the guests will surely appreciate. How far is Siam Swana Hotel Bangkok from the international airport? Siam Swana Hotel is around 41-minute drive from Suvarnabhumi International Airport. Is the hotel easy to access tourist destination and terminals nearby? Yes, the hotels location offers easy access to all the popular tourist spots and terminals. Does the hotel have its own spa and wellness centre? Yes, the hotels Dream Spa provides rejuvenating body and Thai massage. Does the hotel provide luggage storage? Yes, the hotel provides luggage storage for all guests. Does the hotel provide non-smoking rooms? Bangkok is a great choice for the ones who are interested in friendly locals, convenient public transport and street food. Set in the best rated area in Bangkok, Siam Swana Hotel is a perfect choice for travelers. Ratchatthewi BTS Skytrain Station is just a 3-minute walk away from the hotel. Also, MBK Shopping Centre and Siam Paragon is a 10-minute walk from the hotel. The hotel is also known for offering warm hospitality with friendly staff. One can enjoy stunning views of the rooms. Whether its a massage, spa or wellness service, the guests have endless ways to unwind. Get a taste of authentic local cuisine made from the freshest ingredients at Sushi Masa and Pool Bar Cafe. Further, the hotel offers free movie channels for the guests to enjoy the stay at the hotel. Guests can also receive Thai massage for relaxation. Meanwhile, adults can enjoy at the hotels bar to experience the nightlife of the place. Phaya Thai is a great choice for travelers interested in shopping. Siam Swana Hotel ensures that its guests get an exclusive slice of paradise.